Take your pick with the obvious criticism you can derive from this movie’s title: the thrills were killed during production, you feel more killed than thrilled by it, etc. Any and all will be true, as Thrillkill is decidedly not thrilling and is instead a dull entry in the 80s techno-paranoia cycle. Actually, to include it in that cycle is being kind of generous since its failure to really embrace the concept of “the game that plays you” is one of the many reasons Thrillkill is better left unplayed. Carly Kendall (Diana Reis) is a program designer who also moonlights as an elite hacker (back when leet speak was being formed!) who manages to embezzle about 3 and a half million bucks from various accounts. Unbeknownst to her partners, she’s somehow funneled the money into the programming of her latest game, Thrillkill; had they known this, they probably wouldn’t have plotted to kill her (though it’s hard to say because somehow these master thieves eventually reveal themselves to have a combined IQ of 90). Anyway, in a Psycho-style twist, Carly is offed early, but not before she leaves her sister Bobbi (Gina Massey) with some important information. Enter detective Frank Gillette (Robin Ward) onto the scene, whose first order of business is getting into Bobbi’s pants before finally figuring out what’s become of all this money. What’s become of it isn’t a mystery to us, of course; we know it’s hiding inside the programming of Carly’s mammoth computer whose monitor would probably crush a small child. As such, the procedural here has a deathly pace that sees Ward trying to wine and dine Massey, all the while being suspiciously adamant about discovering the location of the money. This is because he’s actually revealed to be in on the whole scheme and is partners with the people who already killed Carly and who now want to take out her sister. This sounds like a big reveal, but it isn’t, as it’s more of a casual discovery for viewers that just represents the tip of the iceberg in terms of shifting loyalties and betrayals. Oddly enough, Thrillkill slogs along quite typically, and we keep waiting for the Massey to catch on that she’s being deceived by this slimeball--well, in theory, anyway. I mostly just wanted it to happen because it’d signal that this movie’s end was near. Said ending is where things finally get a little wild--incomprehensibly wild, even, as there are double and triple-crosses and maybe quadruple crosses (I lost count), all of which start to pile up recklessly during the last ten minutes or so. All of the exposition in the world here can’t really untangle it in any graceful way, and it’s all quite ludicrous and dumb, just as you’d expect most 80s movies centered around computers to be. On that note, I actually couldn’t help but wonder why Carly needed to embezzle money in the first place since her Thrillkill game is ridiculously ahead of its time in terms of graphics. This is only because the “in-game” sequences are actually brought to life by live action, but still--video games these days still don’t look this good. I can only assume Thrillkill exists in an alternate 1980s where stuff like Tron actually existed. Speaking of Tron: that’s what I assumed Thrillkill would be a take-off of, with people being stalked in a virtual world or something. Both the tagline and an early sequence where a computer eerily tells a victim that it wants to play a game set this up, and it’d certainly be preferable to this sluggish relic that was already dated by the time the 90s rolled around. This is a bad story poorly told with vapid acting and dusty production values. Another film that looks like it could have premiered on the CBC, Thrillkill is creaky-looking and rife with editing flaws (for example, one conversation is repeated nearly verbatim at one point). Genre fans will be disappointed at how dry it manages to be; in fact, it’s even difficult to consider it much of a horror film considering its paucity of murders and scares. Suspense is also non-existent and we’re instead saddled with a lot of people talking and playing the Thrillkill videogame. Also, Ward’s character keeps his pet goldfish in his sink rather than a fishbowl; I’d consider this a character quirk, but it’s just as likely that there wasn’t any room in Thrillkill’s budget for an actual fishbowl. 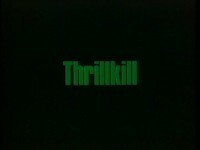 Thrillkill is a long forgotten Canadian z-movie that should stay that way, but don’t tell Scorpion Releasing that. 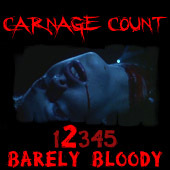 They’ve released it as part of a two-pack alongside Mark of Cain (which also stars Ward, so any members of the Robin Ward fan club are having a good year so far). This is certainly the worse of those two, which is really saying something since Mark of Cain will act as a mark of shame in many collections. Anyway, the film looks like it’s been taken straight from a VHS source with little remastering; all of the headroom in the frame leads be to believe that this should be letterboxed, not that it really matters. The two-pack in question is a budget release, and it’s not a bad deal until you consider that even paying a buck or two for Thrillkill would be a buck or two too many. Trash it!